Famous with GodSeveral years ago my wife gave to me a the gift of a little book “C.S. Lewis on Love”. 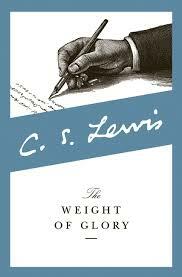 This morning as I read a short chapter”The Pleasure of Praise” taken from The Weight of Glory a sermon given by Mr. Lewis in 1941, it touched me deeply. I wrote in my journal, “Lord I want to be famous with you, to hear You say well done good and faithful servant.” Of all the fame we might acquire on this earth this accolade stands far above all else. Below is a portion of that chapter. and the other ridiculous. Either glory means to me fame, or it means luminosity. As for the first, since to be famous means to be better known than other people, the desire for fame appears to me as a competitive passion and therefore of hell rather than heaven. As for the second, who wishes to become a kind of living electric light bulb? I suddenly remembered that no one can enter heaven except as a child; and nothing is so obvious in a child— not in a conceited child, but in a good child—as its great and undisguised pleasure in being praised.